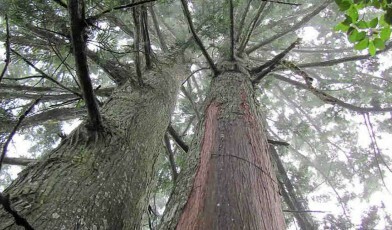 A giant of the tree world, the Chinese Coffin tree is a conifer that can grow to 50m high and 3 metres across with large, buttress roots. Native to eastern Asia, it grows in the mountains of central Taiwan, mainland China (Guizhou, Hubei, Sichuan, Yunnan provinces); Myanmar and Vietnam. Like other conifers, it has needle-like leaves but, after it reaches an age of over 100 years, these leaves undergo a gradual transition, eventually turning into scales. The cones are small (less than 3cm long) and have around 20 thin, fragile coverings, each containing two seeds. The timber is highly valued as it is considered to be easy to work, light, durable and has pleasant spicy scent. It is used to make a range of high quality products including furniture, bridges and boats but it is particularly sought after to make coffins, a use which gives its popular name. Because of its popularity, coffin makers are heavily reliant on the timber and the disappearance of these species would have a huge impact on their livelihoods. Despite this, logging and forest clearance have led to a major decline in the number of Taiwania tree individuals in recent decades. Poor regeneration also contributes to the vulnerability of the tree. Protection of the wild trees is essential, but there is also a need to reinforce these populations with nursery grown trees. The Global Trees Campaign has been working on Taiwania and other Vietnamese conifer species since 2005, and in 2007 helped establish the Conifer Conservation Centre (CCC) and a number of tree nurseries in northern Vietnam. Taiwania tree seedlings have been successfully grown in these nurseries and, with the help of local communities, used to reinforce the wild populations of the tree. In addition to reinforcement, all known wild trees have been measured and tagged for monitoring purposes. 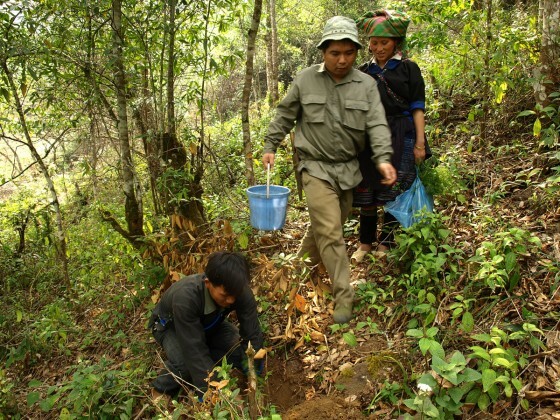 The inclusion of the species as an official government reforestation species is an ultimate objective, allowing the communities to generate income from sustainable seedling production whilst increasing populations and sites for the species. In the UK, Bedgebury National Pinetum has had over 30 trees donated to them by the International Conifer Conservation Programme, based at RBG Edinburgh. This profile was researched and written by Arianne Davies.